The widely acclaimed Austin, TX Peterson Brothers Band performs in a free, outdoor concert from 8 to 9:30 p.m. at the Levitt Pavilion in Westport. The Peterson Brothers combine youthful energy and modern influences with old-school blues, soul and funk to a create a sound that is uniquely their own. The band possesses a modern blend of blues, soul and funk. Glenn Jr., 20 on guitar and lead vocals, and his brother Alex, 18, on bass and background vocals, have been playing together since they were young kids. 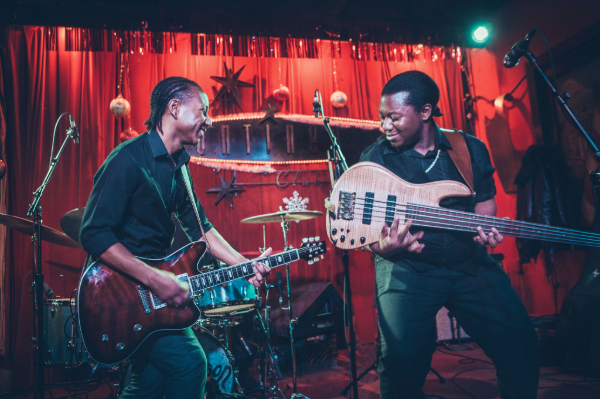 Rising stars in Austin, TX, the Peterson Brothers have been referred to as, “The future of Austin music” by Mark Murray of Sun Radio in Austin, and “Some of the most talented musicians I have seen come out of Austin” by Jamfeed. The band holds a standing room only weekly residency at Austin’s famed music hall, The Continental Club. “You can’t help but smile when you watch them play” — Texas Lifestyle Magazine. “Their set was bristling with fun and infectious energy” — Austin360.com. “The Peterson Brothers Band just rolled into Houston and killed it with blues, funk and some good ol’ rock ‘n’ roll….” — Hanks Americana Radio. “The Peterson Brothers delivered an amazing blues and R&B set that was part Isaac Hayes, part Stevie Ray Vaughn and part Stanley Clarke.” — Twangville.com. “The only thing missing from the Peterson Brothers Band is the word “amazing” at the front of the name.” — San Antonio Express-News. In addition to having played with and opened for the likes of Gary Clark Jr., the late B.B. King, Buddy Guy, Los Lonely Boys and Willie Nelson, they have appeared at festivals throughout the United States, including the Chicago Blues Festival, Minnesota State Fair, Riverbend Festival, Austin City Limits Festival, Ogden Roots and Blues, and many more.